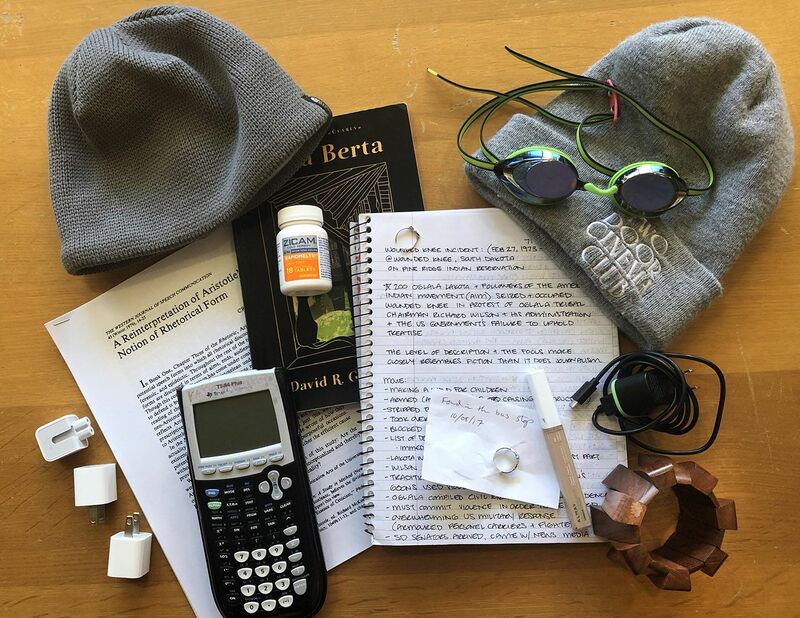 You can learn something about students from a visit to the Ladd Library lost and found. For one thing, says Connie Mulane of the circulation desk, you can tell that the library “is their home,” a place where they study, hang out, and spend lots of time. Here’s a partial catalog — not including various pullovers, mugs, and water bottles — of items seen today. Class notebook with notes about the 1973 Wounded Knee incident. Knit winter cap embroidered with “Two Door Cinema Club,” an indie rock band from Northern Ireland. North Face knit winter cap. Plastic bottle of Zicam cold relief pills. Well-used Texas Instruments TI-84 Plus graphics calculator. Photocopied article, “A Reinterpretation of Aristotle’s Notion of Rhetorical Form,” by Craig R. Smith, published in The Western Journal of Speech Communication, Winter 1979. Funky and crafty wood bracelet. Copy of the novella Doña Berta by Spanish novelist Leopoldo Alas, edited by Senior Lecturer in European Studies David R. George Jr.